The parishioners laid the cornerstone of Holy Trinity (née Holy Family) Church in 1863. For the next two years, Thomas O'Brien of St. John's worked with the local people to build the magnificent stone church. It is the last of five stone churches that Roman Catholic Bishop John Thomas Mullock ordered built during his tenure. Local fishermen helped by transporting the stone for the building from Stone Island, approximately two km. across Calvert Bay. On September 10, 1865, Bishop Mullock consecrated the new church. The church was still not complete and it took until 1898 for the final stone tower to be finished. Holy Trinity is a good example of a Gothic Revival stone church, and is the last surviving of a group of five stone churches erected during the episcopacy of Bishop John Mullock (1848-1869). The parish priest was Father James Murphy, whose devotion to the church was so complete that he requested to be buried beneath the church floor. Today there is an inlaid cross in the floor showing his final resting place, on the bell reads "J. Murphy, Founder; Dublin 1852." Thieves stole the bell from the church and sent it to a smelter in Ottawa. Luckily, it was discovered and returned to Ferryland, where it is housed in the local museum. 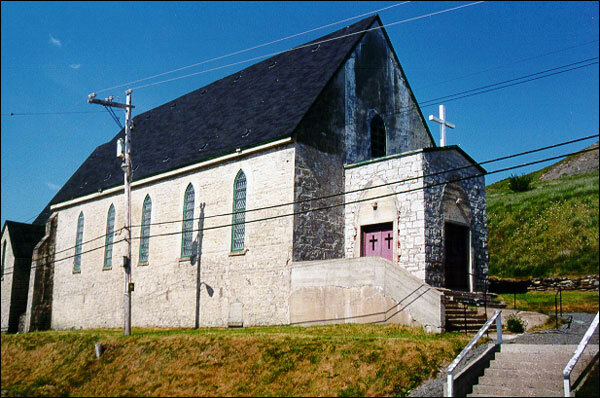 The history of Roman Catholicism in Ferryland dates back to the arrival of Lord Baltimore in 1627, 157 years before the formal establishment of the Roman Catholic church in Newfoundland. Baltimore believed in religious toleration and had both Church of England and Roman Catholic services held in his home. Historian R.J. Lahey went as far as to claim that Ferryland was the "birthplace of religious freedom." It was the first place in British North America where an English speaking Roman Catholic priest held mass. The spirit of toleration was still evident after the construction of the church: A local newspaper reported that some prominent Ferryland Protestant businessmen donated handsomely to the cost of the building. Lord Baltimore found the weather exceedingly harsh and decided to move his family to a fairer climate in Maryland. His parting words were: "I commit this place to the fishermen that are better able to encounter storms and hard weather." The stone church is evidence of the spirit of devotion and the work ethic of the fishermen and their descendants. The church also represents the sacrifices made by local residents. In 1927 a marble altar from Rome was added as a memorial to the Ferryland residents who died during the First World War. Sadly, workers dynamited the altar during renovations in the 1960s. The iron statues and a crucifix are from the wreck of the vessel Torhamvan that sank in Ferryland Harbour on October 29, 1926. The people of Ferryland have renovated the church on several occasions. The few original features include the five leaded glass windows on each side of the church and the wooden wall panelling on the east and west walls. The outside has had drastic changes as well, including the removal of the tower. Despite the interior and exterior modifications, Holy Trinity retains its Gothic style with its pointed arches. In 1989 the parishioners decided to devote their time and energy into restoring the church. It was declared a Registered Heritage Structure in April 1995. Also view Holy Trinity Roman Catholic Church Registered Heritage Structure on the Heritage Foundation of Newfoundland and Labrador web site. The Newfoundland and Labrador Heritage Web Site has on its site only a portion of the registered heritage structures in Newfoundland and Labrador. To view a complete list or search for a particular structure visit the Heritage Foundation's Property Search page.